The return of one of the most appreciated bands of the European post industrial underground. 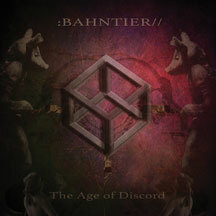 The return of one of the most appreciated bands of the European post industrial underground, Bahntier are back with The Age of Discord, the new album characterized by a bombastic sound both fresh and classic at the same time, with tracks effortlessly swimming between harsh distorted industrial, post-wave electro, ritual noise and more. Stefano Rossello ( Bahntier's founder, Detune-X , Ketvector) provides a voice fraught with disturbing overtones and dark experimentations, Justin Bennett ( Skinny Puppy / kETvECTOR / Askew ) and Filippo Corradin ( The Lingams and Yoni ) provide a foundation of acoustic and electronic tribal rhythms with scathing modular synth tapestries. Bahntier always surprises fans and this release is no exception, offering a sonic concept that's sure to make it's mark. This is The Age of Discord, and this is the unique sound of Bahntier!